“Salento, the sun, the sea, the wind” says a popular saying in Salento. And indeed reason to celebrate the beauty of this region are all there. Mild climate and crystal clear waters, pristine white beaches, breathtaking countryside and boasts great natural diversity from area to area. Both on the Ionian coast is on the Adriatic of the Salento peninsula, history and local traditions are combined with incredible sea and beaches dream. We present the most beautiful in this article (if you want to add more, you can write them in the comments 🙂 ). 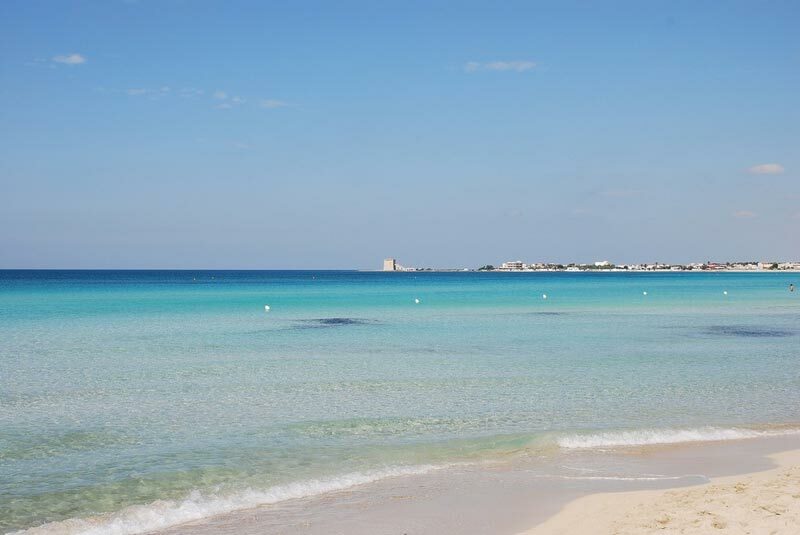 Porto Cesareo is located in the northwestern part of the Salento peninsula and is one of the locations from the crystalline sea among the most coveted by the summer tourism. It is about 26 km from Lecce and is reachable by road or train from Copertino. It is the seat of the Natural Reserve of the Earl Marsh and Dune Coast for the rich fauna of the seabed also. 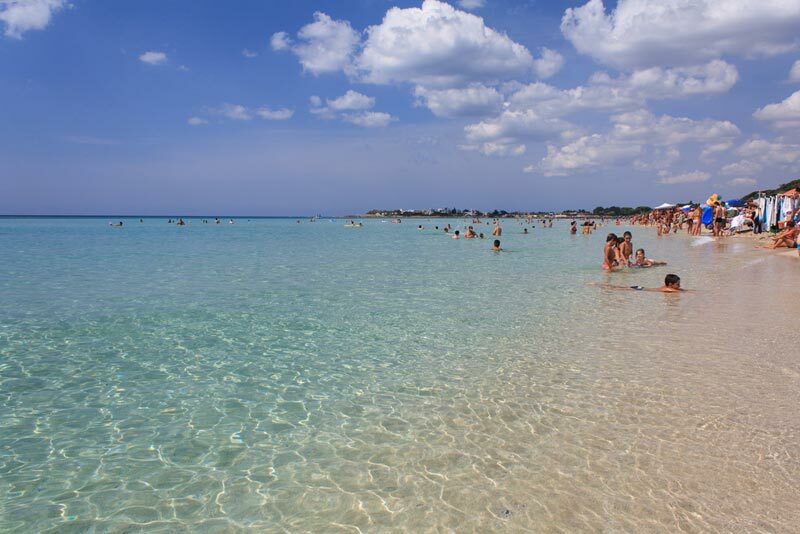 The beach of Porto Cesareo is characterized by dunes, Mediterranean maquis, sandy coves and low cliffs. The coastal area overlooking the fishing village is small and very crowded in August with families and kids. upkept beach and recommended for those who enjoy the vibrancy, sparsely populated, however, during the low season (May, June, September and October). 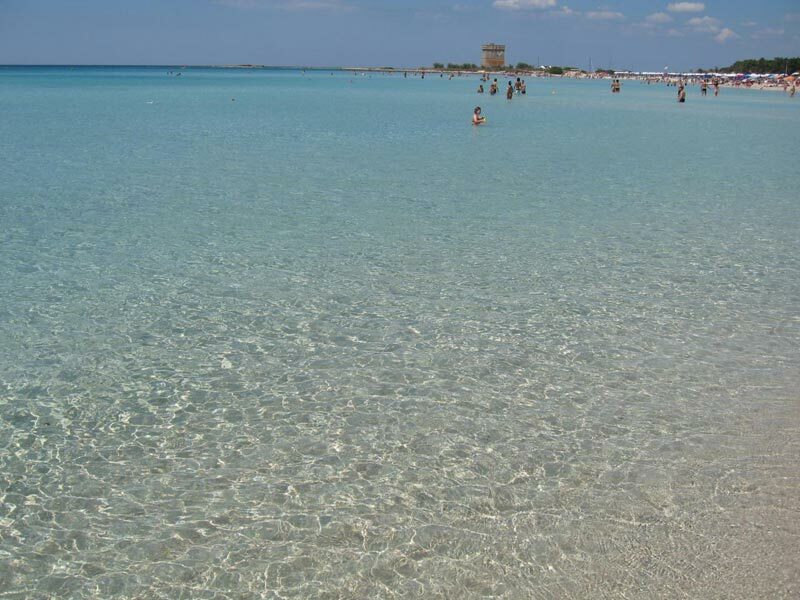 Torre Lapillo is located 6 km north of Porto Cesareo and can be reached from the SP340. Characterized by low costs and crowned with a “reef” ideal for snorkeling, it is equipped with several establishments alternate with free beaches. The water is incredibly clear and the beaches clean and cared for throughout the year. Frequented by tourists and locals, the night is enlivened by locals with dancing. The summer season lasts from May to September thanks to numerous waterfront villas that can be rented for the holidays; during the off-season, however, it is populated by European tourists. It is continuing north at 7 km from Torre Lapillo on the SP122. It is one of the most beautiful beaches of Salento, but different because the wild, with the Mediterranean scrub and old dunes. It is the ideal destination for family tourism for the shallow waters of the beaches that allow control of children. Very appreciated by sportsmen who practice sailing sports and snorkeling in its enchanting backdrops. Very populated in August in the rest of the season is especially popular with residents. The beach is free, very clean and made of fine, soft white sand. Welcomes also holidaymakers who enjoy the solitude in September. Torre Guaceto is named after an ancient tower of sighting of the same name in 1500 and includes a nature reserve and marine characterized by the uniqueness of the landscape lido, Mediterranean and secular olive scrub. There are also wetlands and marshes visited with Cycling, explorable seabed diving with a guide or by sailing the authorized associations. The beach is rocky, but equipped for a stretch with umbrellas and chairs, food court and access for the disabled. Frequented by those who want to combine the holiday with a love of nature, it is a safe place and to be discovered, a wild beach with a thousand blue-greenish hues. Very popular both in high and low season, you are reached through the BR-S379 BA, Serranova exit at km 35. Melendugno’s center of Salento with several beautiful beaches such as Bear Tower, a bay with bathing facilities and very crowded in August. The water is clean and shallow so it is great for families and kids. At times the white rock coast falls sheer to the sea and offers breathtaking views. Blue Flag 2014, in low season is quiet and the pinewood gives it an exotic charm. Torre Sant’Andrea, however, affects mainly for its magnificent cliffs that attract every year thousands of tourists and nature lovers. It is a small bay accessible from SP114, beautiful because it does not have the classic sandy beach, but of pebbles and then immediately the cliff where you can do fun dives deep into the water. The surrounding trails lead to the protected area of the Regional Natural Park Porto Selvaggio and Captain Marsh. Very populated in the summer it is almost deserted in low season. Transparent water and ability to walk on the rocks make the place suitable for agile vacationers who love the wild side of nature, especially in July and August. San Pietro in Bevagna is 12 km from Manduria (TA), a disarming beauty for aquamarine waters and the shallow waters. The sandy beach and free presents a walkway leading to the shore, useful to avoid damaging the lush Mediterranean vegetation. In May and September is almost deserted, while in high season is visited by an intensive tourism that want to enjoy a sea of Caribbean traits. It is much frequented by domestic and foreign tourists especially couples and groups of friends, in addition there is the possibility of renting umbrellas and chairs if necessary. Dunes and long beaches lend themselves to relaxing walks and low cliffs are a joy to behold. In facing the seabed it can be seen submerged ancient Roman tombs. Beautiful wild beach of the Ionian coast a few kilometers from Manduria, is located on the SP141, near the center of Maruggio. The beach is clean and interspersed with clumps of wild herbs. Very populated in August is rather deserted for the rest of the season, but it is equipped with a beach, playground for children, umbrellas, deck chairs, bars and refreshment. The color of the sea always clear and transparent range from cobalt blue to emerald. The coast is low and in some places it is necessary to wear shoes for the rocks to the presence of stones. Very crowded on weekends, it is suitable for families and for those who love diving. It is also the only marina and fishermen in the area. 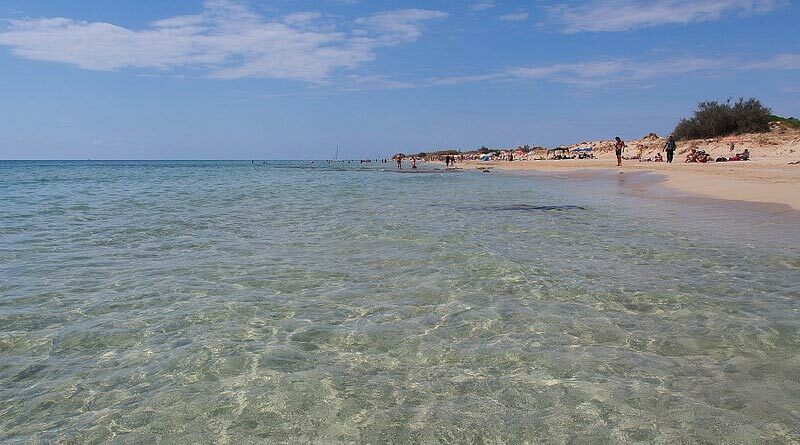 Spectacular nearest beach to the equally picturesque town of Gallipoli, which thins out towards the sea with a rocky and rugged coastline, sheltered behind by lush vegetation covering the dunes like a carpet. Very nice settlement on the two parts of the beach that stretches out towards the small island on the sea from which you can admire beautiful sunsets. Particularly popular with young people, is also enlivened by background music that comes from the factory equipped with paddle boats to explore the beautiful coastline. It is populated by foreigners in the months of July and August, and frequented by residents in the rest of the season. 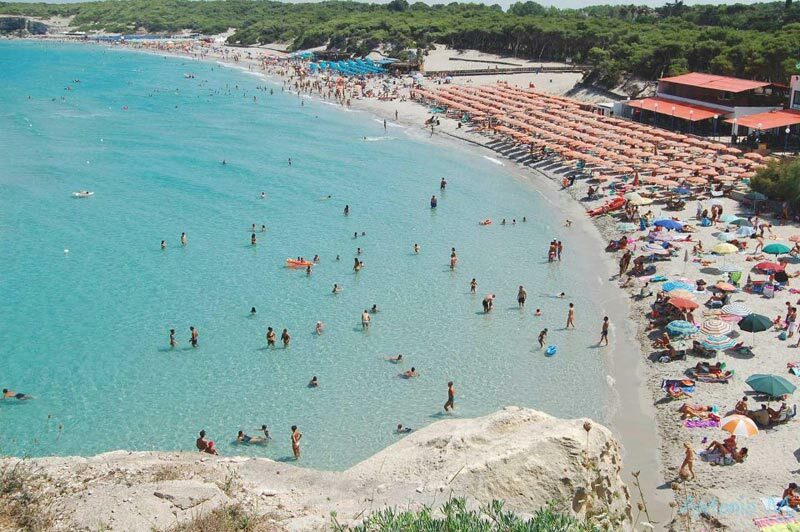 Discover other beaches of Gallipoli. The beautiful city of Otranto has two beaches to visit absolutely: the Bay of the Turks and Alimini. Both are located on the SP366-SS16 surrounded by olive trees and typical stone walls. The beach is preceded by a pine forest of the Mediterranean where it is pleasant to walk or have a picnic. The Bay of the Turks has a rugged coastline at times, while that of Alimini is enhanced by the presence of homonyms lakes in the Natural Park, parallel to the beach itself. Several beach resorts, with the possibility of practicing kite-surfing and wind surfing. Picturesque bays and coves in this protected sea area inhabited all year. It is located at the far end of the heel of Italy and attracts both vacationers with family of young people who love the night life and entertainment facilities. The favorable climate makes swimming from late April to late September. The coast, high and rocky, has clear water beaches that are accessed by stairs. Picturesque caves visited with small boats. It is Blue Flag in 2014 for his Caribbean Sea. A small fishing village is characterized by a coast overlooking the sea with small transparent water coves frequented by many tourists, even the place. Wild and sheltered is home to many natural caves, some visited only by sea. Free beach and crowded only in August. It is a small beach made from a cove and topped by a bridge with rocks divers exploit for evolutions before reaching the water. It comes with a steep staircase and the sea is fabulous. Set between two high coastline it is crowded in July and August and is enjoyable in low season. It is located on the road to Arigliano. It is truly a special place with a beach on a rock is the turn of a collapsed sea cave, that of Poetry. A marine paradise where to plunge, loved by local visitors and populated by the boys and in August, much less in low season. It reaches the SP297 and has a spotless sea. It’s really a dream this 4 km long beach with white and soft sand that reflects the light and makes the transparent water. A beloved piece of paradise by tourists from April until September, where the beach is free, and you can admire spectacular sunsets. 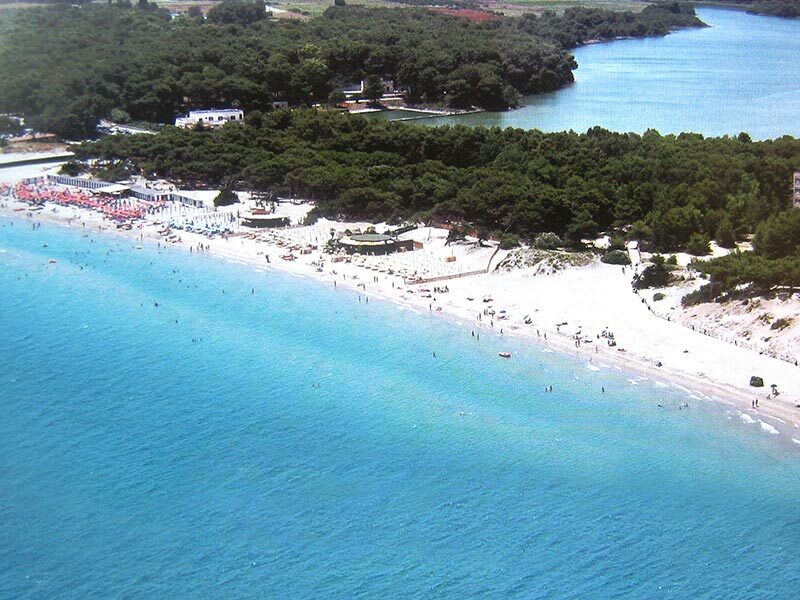 Marina di Lizzano is part of the municipality of Lizzano overlooking the Gulf of Taranto, between the resorts of Marina di Pulsano Torre Ovo east and west. The beach, very popular with tourists from Italy and Europe, is characterized by white sand, free and equipped, interspersed with Mediterranean vegetation.